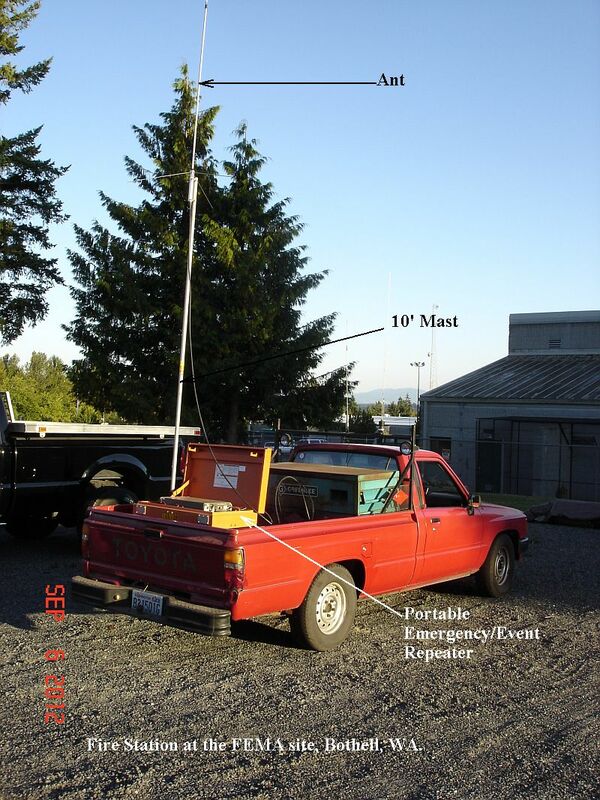 This is a completely self contained Emergency Repeater. 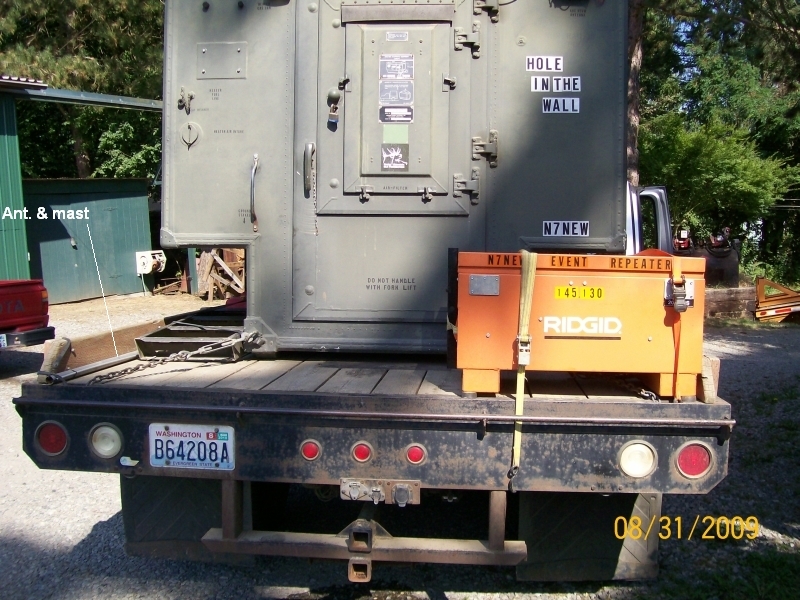 Load it in the back of a vehicle and haul it to where ever it is needed, hook it up to a 12 volt battery, plug in the Antenna and it is on the air. 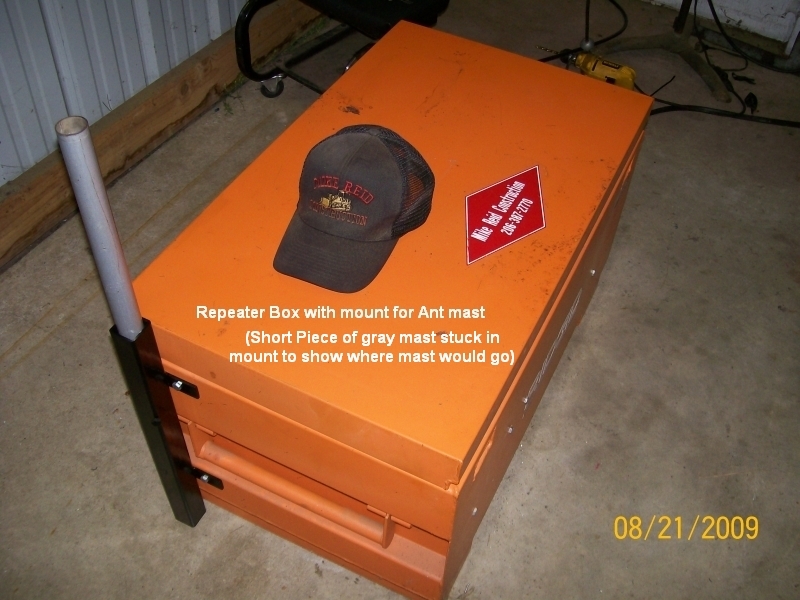 The ant mast slides into a bracket on the corner of the job box and you just tighten the thumb screw to keep it there. If you fasten the ant mast to something else, you don't even need to unload the box out of the vehicle. Thanks to WA7HTJ, W7GLB & W7HNH for all their great help! Having a need for a portable repeater I decided to build one. 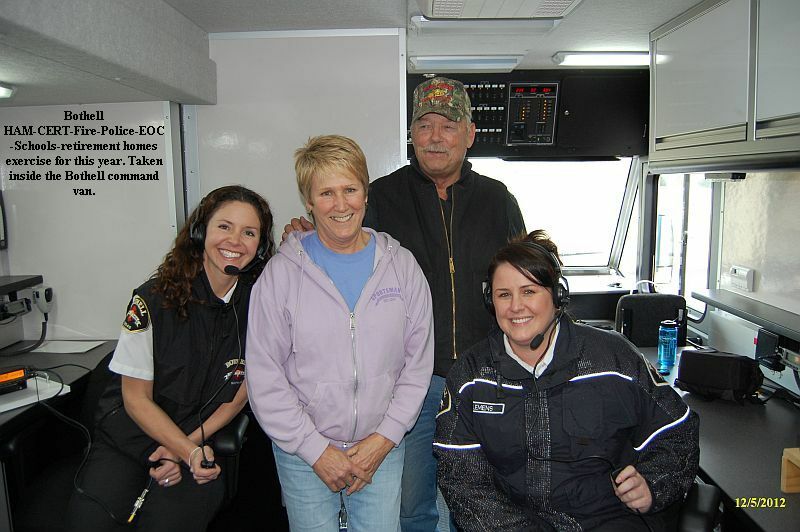 The Cle Elum & Ellensburg Ham Clubs have many events that they do communications for over the summer months. 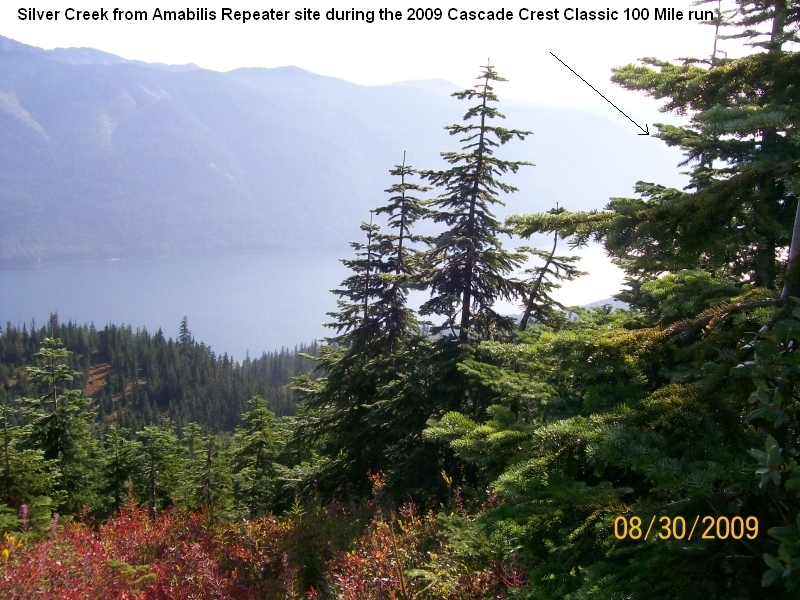 One of which is the Cascade Crest Classic Ultra Marathon. We tried cross-banding and it worked fine except for the normal problem of people doubling because of not being able to hear each other. 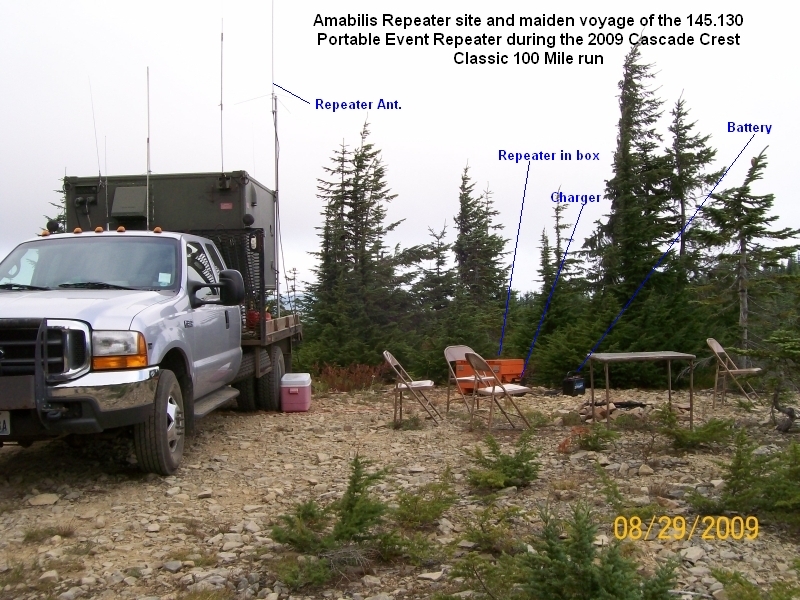 So we started thinking about a portable repeater. 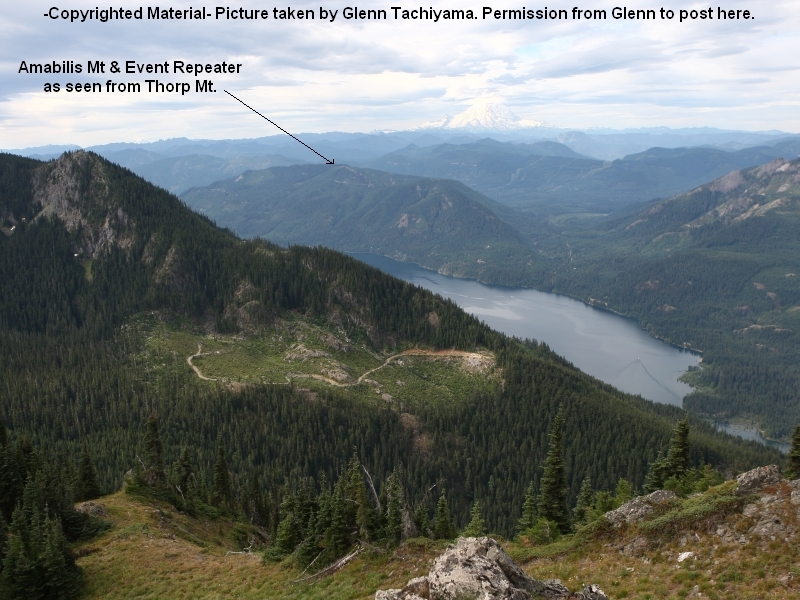 I decided to use one of the SNP (shared non protected) pairs to avoid Coordination on both sides of Cascades. The PA board in this radio puts out over a 100 watts. We have it turned down to about 45 watts and have had it up and running almost continuous for 48 hours at a time without damage. I installed three 2" fans on the PA cooling fins. We Modified the receiver Osc/mult board to make it a low band per GE specs. Then found a dead stage in the IF board. Changed that board out and the receiver sensitivity came down below .5 micro-volt. 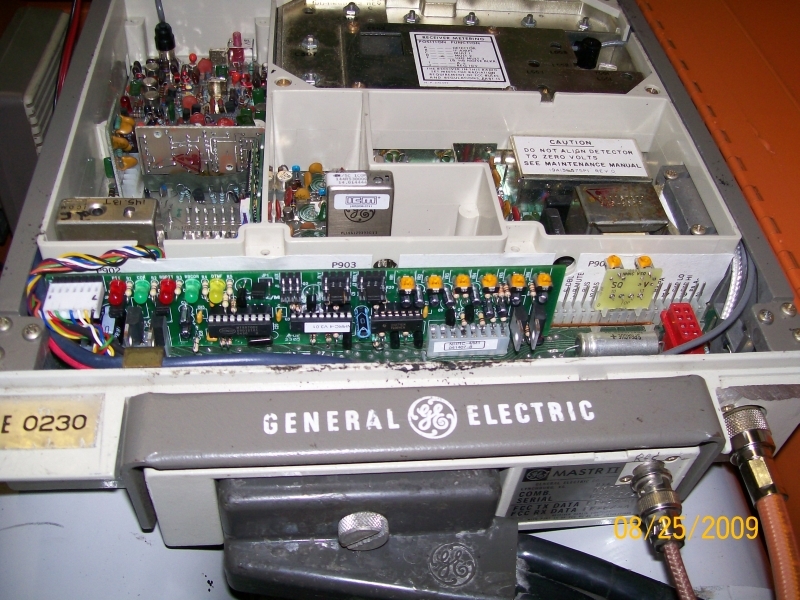 Modify VHF oscillator/multiplier found in a GE Mastr II radio for better performance. The sensitivity of the stock GE Mastr II 150.8 receiver may be limited by low local oscillator injection when tuned to the amateur 2 meter band. The problem is more apparent as frequency goes down. The following modifications will improve the injection resulting in up to 4 dB more sensitivity or more. Usually the 150.8 receiver provides fairly good sensitivity in the ham band. 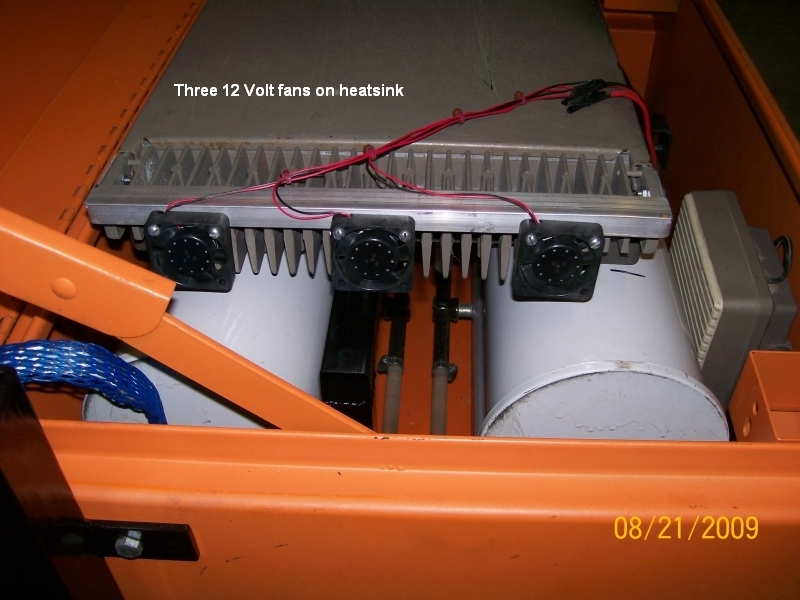 We like to end up with about -116 dBm or .35 uV for 12 dB SINAD. When it doesn't meet this specification, 9 times out of 10, it's due to low Local Oscillator injection. On the later model Osc/Mult boards, (the ones with the trimmer capacitors), there are a few fixed value capacitors that you need to install or increase in value. After getting the receiver tuned up, we worked on the PA board. It had some problems so we swapped it out for a good one. When turned up it put out 120 watts. Set the output to 40 Watts. We set the levels and called it good to go. After that I made the mods to duplex the Mastr II per MASTR 2 Infosite instructions. 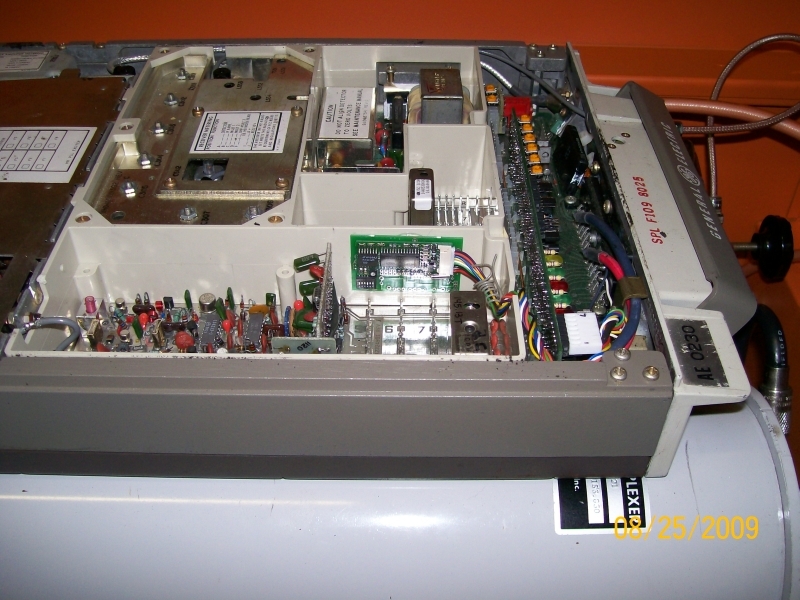 The NHRC controller went in like clockwork as did the Communications Specialists TS-64 DS Tone board. Added the NHRC-VSQ MASTR II Internal Volume & Squelch control at the last. Hard wired a speaker after cutting the control head cable shorter. W7GLB modified the Wacom Duplexer and tuned it up for me. Had to change Cable Harness to right lengths to get it to tune to 144.530/145.130. 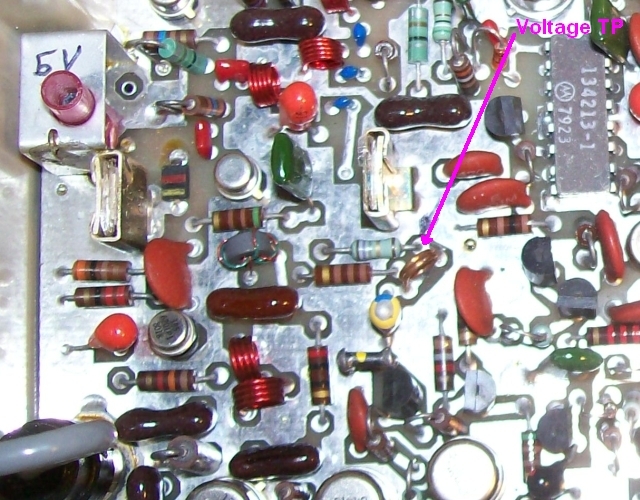 Remember, this is on the 2M ham band, (low end)... changed the slug in the VCO coil to ferrite. It was aluminum and placing a ferrite slug in the coil form will lower the resonance, allowing better PLL lock, especially in cold weather. After testing the repeater out for some months at various events, I found that the PLL board would not lock every time. Ordered up a ferrite slug for the VCO coil (Repeater Builder) and replaced the aluminum one with the new ferrite slug. Also sent in a new Icom (International Crystal Manufacturing) for crystal cut & temp comp for the PLL board. Installed both and tuned up the VCO coil 3/28/2010 with Bobs help. Set VCO voltage to about 5.64 Volts. 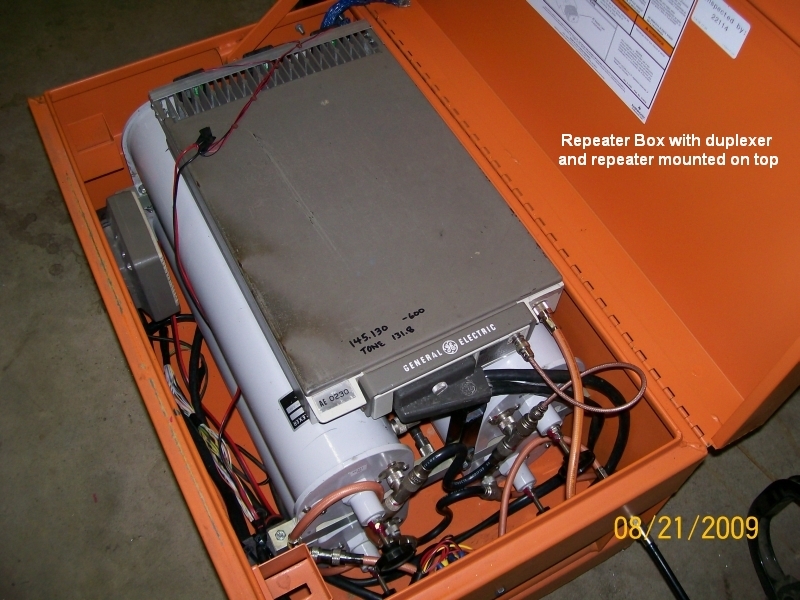 Have had the Repeater on the air here at the home QTH for 3 months using it locally. Have not had one problem with it since changing the VCO coil to ferrite. 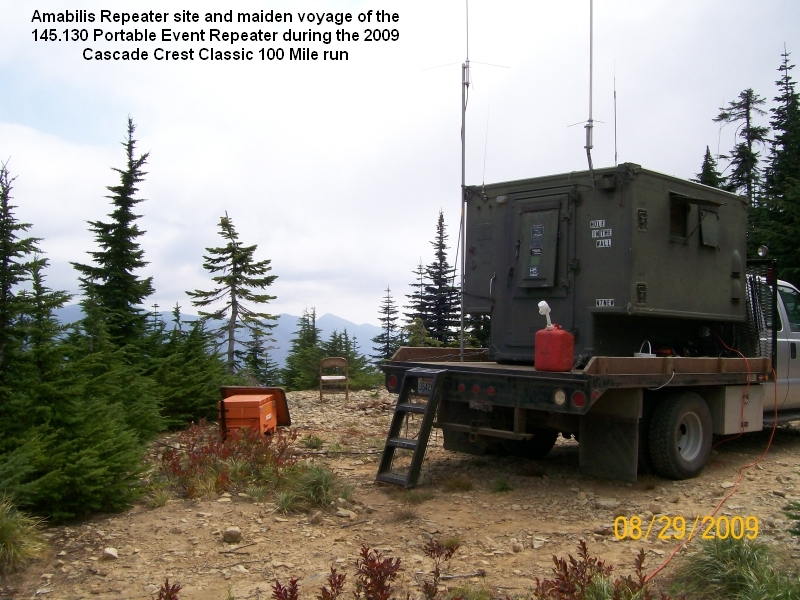 Used the Repeater for the Cascade Crest Classic 100 mile ultra over the weekend. 8/29/201 Sunday 4:00 PM without a glitch. I am real happy with it. By the way a new course record was made this year... 18 1/2 hours for the winner. 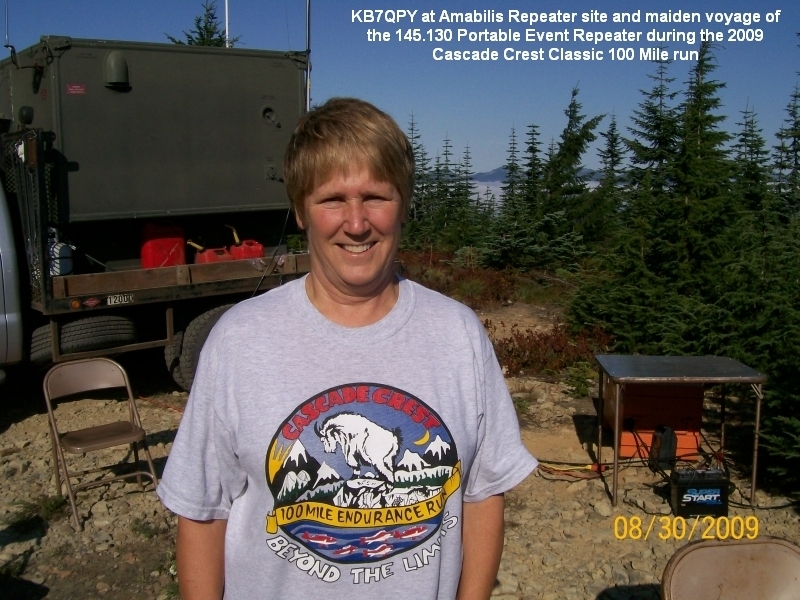 Used the repeater for the 2012 Cascade Classic 100 mile Ultra Run. It was on the air from Friday late afternoon until late Sunday afternoon. 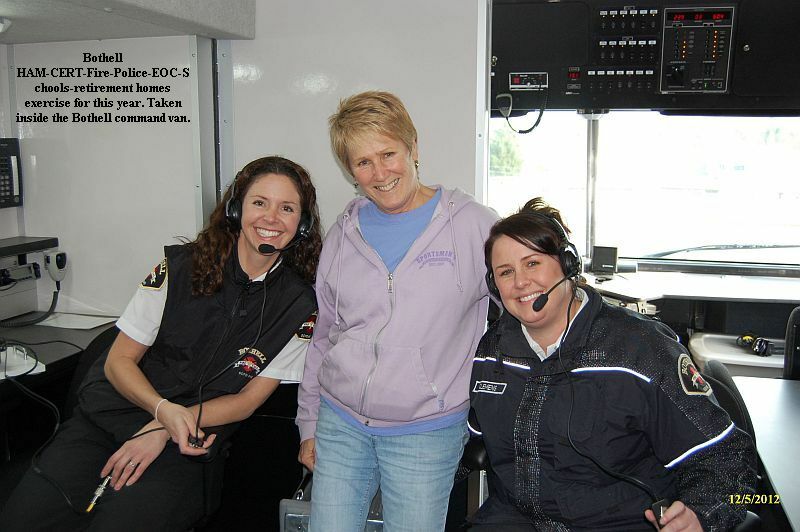 Used the repeater for Bothell HAM-CERT-Fire-Police-EOC-Schools-retirement homes exercise for 2012. 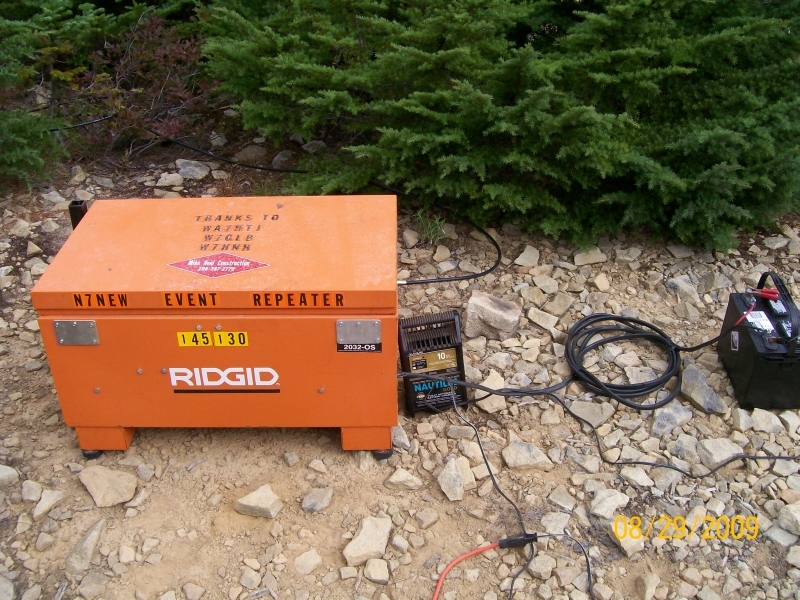 Repeater was up and running on battery power with no problems for this emergency exercise. Picture showing Communications Specialists TS-64 DS Tone board mounting. Maiden Voyage to be August 29/30 2009. Will let you know how it held up. August 31 2009... Well the repeater did a great job. It had only 2 glitches. One was Saturday Night about 9:30 PM and the other was Sunday morning about 10:00 AM. Both times it was the same problem and only lasted about 2 minutes each. The phase locked loop quit locking for a couple of min. The first time it started working again before I got the lid off the radio. The second time I had time to adjust it a smidgen. It did not fail again after that. Will be checking that out further right away. Here are some pictures of it's maiden voyage on the 2009 Cascade Crest Classic. 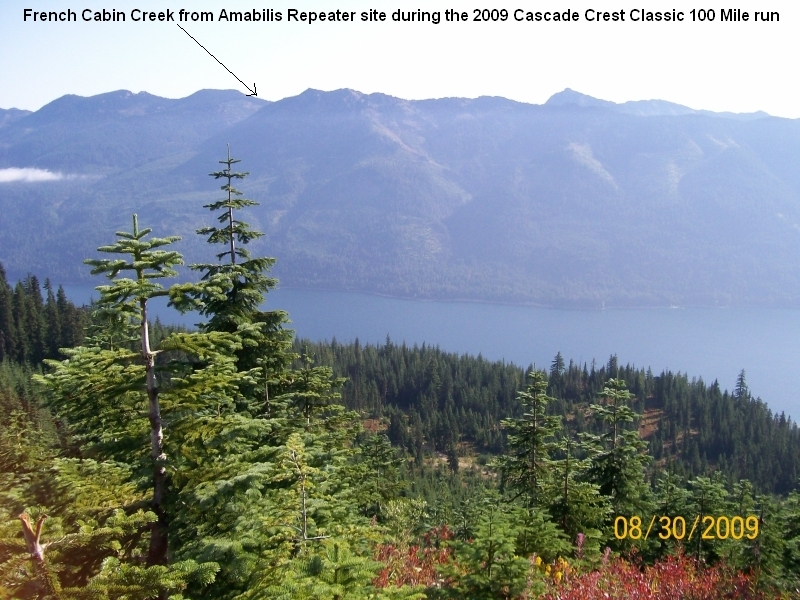 Amabilis as viewed from Thorp Mt. Thanks Glenn ! 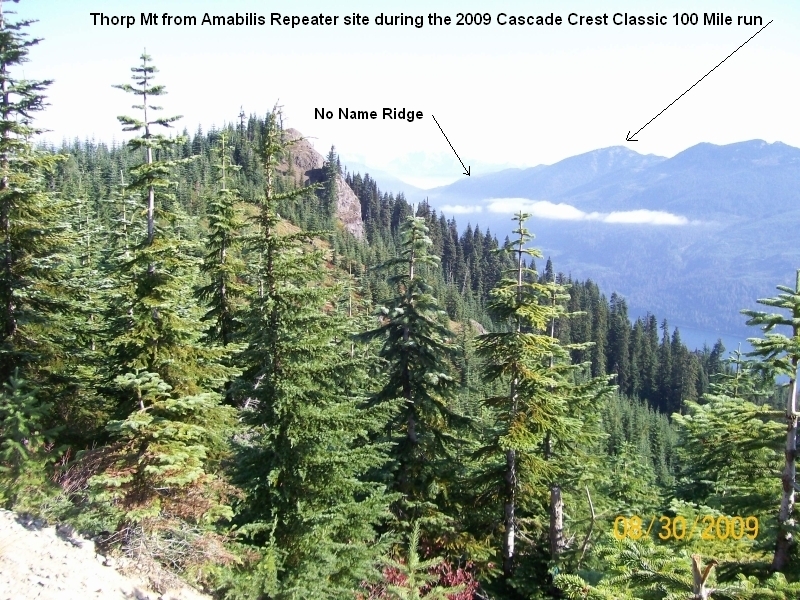 Cascade Crest Classic Aid Station Sites as viewed from Amabilis Mt Repeater site.